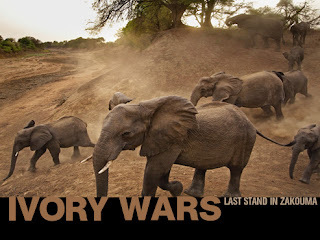 This elephant's ancestors had survived centuries of raiding by the armies of Arab and African sultans from the north in search of slaves and ivory. He had lived through civil wars and droughts, only to be killed today for a few pounds of ivory to satisfy human vanity in some distant land. In Zakouma National Park, antipoaching is dangerous business. Officially, guards are allowed to defend themselves if poachers shoot. Unofficially, it is shoot-to-kill on both sides, so better to be the first to pull the trigger. Somehow, despite a tumultuous history of slavery, colonialism, and civil war, humans have found a place in their hearts to make a refuge for wildlife here. Even today, as refugees stream into Chad from Sudan to escape the chaos in Darfur, 200 miles (320 kilometers) to the east, elephants live in Zakouma in relative peace. The natural world persists in abundance, while thousands of our own are dying. Zakouma is the last place on Earth where you can see more than a thousand elephants on the move in a single, compact herd. Then, it happened. Elephants appeared on the edge of the bank, juveniles first, followed by a large female. They stood still, listening. The female nudged one of the young males forward. He resisted at first, but thirst and a mother's insistence drove him down the bank. Other elephants followed, pouring down the steep incline, 30 to 40 of them, babies in tow, heads bobbing from side to side. At the water, they dropped their trunks into the coolness, taking deep drafts of the precious liquid before being pushed forward by the horde behind. As the craving for water subsided, the juveniles started to play, dunking each other; the adults retreated to chuck hot sand over their backs. For an hour, I watched, marveling that these elephants, who spend their lives being hunted and killed by men, can find peace. How do they endure the terror and despair? I have had a close bond with elephants since 1985, when I was doing research in the Dzanga clearing in the Central African Republic. I learned to speak their language—not literally, of course, but I feel as if I understand them. I know their habits, their personalities, their moods. I have laughed with elephants, and I have played their jousting game. Once, I almost died from tusk wounds inflicted by a frightened female on a beach in Gabon. After that, my African bush friends said, "Your blood is now part elephant blood." I also thought about the humans living in this area, their lives ravaged over centuries by the slave trade. In Zakouma, the Goula people built their villages near the rocky crags in the west of the park, in an attempt to escape mounted Arab and Ouaddian raiders, who savaged, captured, and sold them as slaves, decimating their numbers. I have seen contemporary savagery on the same scale in civil war in central Africa, where friends of mine were hunted, raped, starved, and killed. Yet their kids still played; their women still laughed.It is a sad fact that the vast majority of elephants in southeastern Chad don't die of old age. They die at the hand of man. Yet when I meet the Zakouma elephants, all I see is joy. No rage or thirst for revenge—just a desire to protect their young. All the poachers I have ever seen, even those who have killed hundreds of elephants, are still poor, often—by the looks in their eyes—at the expense of their souls. May 24 In the morning, we resumed collaring in the northeast. Soon, the collar was on, and the antidote to the tranquilizer administered. The elephant struggled to get up, then collapsed. Bertrand gave her a second dose of antidote. Minutes passed. Again and again, she raised herself up on her front legs, only to collapse with each attempt. Afraid to look, I flew off. Fifteen minutes later, she was still trying desperately to get up. Pounding the dashboard, I knew I was to blame for her suffering—I had instigated this exercise. On the ground with the elephant, we worked frantically, bucketing 250 gallons (950 liters) of cool water over her back, willing her to recover. It was futile. Using ropes attached to the truck, we gently flipped her from right side to left. That's when we saw her broken pelvis. Any remaining hope evaporated. The order was given. As I walked away, devastated, a gunshot rang through the trees. Having come here as protectors, we, too, were now messengers of death. Over the days, we came upon evidence of rampant poaching: five sites where a hundred elephants had been massacred since May, their trunks and tusks hacked off. Seeing the inert, dismembered bodies of elephants is every bit as disturbing to me as seeing the bodies of humans killed in war. There is a direct connection between depletion of natural resources, including wildlife, and human conflict. The sanctuary of Zakouma is not only a critical last stand for elephants in central Africa but also a force for peace and stability in the region. But if poaching outside Zakouma by villagers living on its periphery, or by nomadic herders, is to be stopped, management must be extended throughout the entire range of the elephants. A wider peace for elephants—and humans.